Small businesses hurt by high fuel prices can follow a strategy once only large companies could use. This story was originally published on March 26, 2011. It has been updated to include new information about the company. REDWOOD CITY, Calif. ( TheStreet) -- Small and midsize businesses hurt by rising fuel prices can follow a risk-management strategy once available only to large companies. Pricelock offers fuel price protection through what is essentially an insurance policy. It is able to offer the strategy online by grouping businesses and working with investment banks. The Pricelock Web site lets business owners hedge against rising fuel costs; clients pay a fee that protects them when prices rise above the maximum they're willing to pay. Buyers of fuel and energy looking to hedge their costs can have as few as three trucks or five pickups. As long as a company is exposed to increased fuel prices, they can use the online service, CEO Naveen Agarwal said last year (he was then the company's COO). Fuel hedging has eluded smaller firms in the past, although larger companies -- including most of the major airlines -- hedge their fuel prices. The company has since expanded to include Pricelock Marketplace, an online auction platform where sellers of energy -- whether that's natural gas, coal or transportation fuel -- can compete for customers. Pricelock launched the additional service in September. Through the platform, suppliers have detailed information needed to compete for business that ensures buyers get better prices, not to mention reduced paperwork and instant access to historical information, the company says. The company has signed up nine of the top 10 natural gas sellers in less than a year, and three of the top five refiners use its service, it says. Now buyers and sellers can use the platform via their smartphone or tablet. The company on Tuesday launched a mobile app version of its energy auction platform called Pricelock Mobile in what it calls the latest step in providing innovative technology solutions that improve the speed, efficiency and transparency of how energy is bought. The free app has the ability to notify energy suppliers about relevant upcoming auctions and allows them to use their phones to track how bids are faring. It also allows buyers to watch auctions in real time from their mobile device so they don't have to be in their office or tied to a computer to watch firsthand how quickly prices move as suppliers compete, Pricelock says. Pricelock's online tools calculates a fuel quote. If national fuel price averages rise above the owner's threshold during a policy's term, Pricelock pays the difference. It is available for iPhone, iPad and Android and Blackberry devices. "Our mission is to use technology to transform the way the energy is bought and sold by streamlining the entire process, creating a more efficient and liquid market and contributing directly to the bottom line of companies that buy and sell fuel, natural gas and coal," Pricelock's Agarwal says in a statement. "Our new mobile app is the next step forward." As for the fuel price protection, small businesses pay a fee that protects them when fuel prices rise above the maximum price of fuel the owner is willing to pay. They pay only the premium quoted them when they set their limits through the company's Web site. Customers use Pricelock tools to set monthly fuel usage in gallons and the length of their contract -- typically six months or a year. The tool calculates a quote. If national fuel price averages rise above the owner's threshold during the policy's term, Pricelock pays the difference. "If gas prices go up, we're going to pay you to offset that amount you're paying at the pump," Liat Rorer, Pricelock's chief marketing officer, said last year. 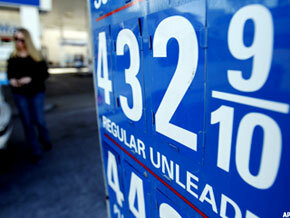 "If gas prices go down you're going to benefit by paying less than what is in your budget." Rorer said the risk-management strategy should be used by any company that has fuel costs as a large percentage of expenses, regardless of volatility at any given time. "The best time to put fuel price protection in place is part of a regular risk-management program as you come into the year doing your budget," she says. "We're really trying to empower the small-business owner to be able to run their business the way large businesses have been run."